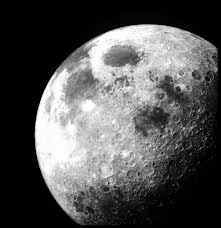 The Moon is a natural satellite of the Earth. A satellite is something that goes around a Planet. The Moon orbits (goes around) the earth once every 28 days. This is called a lunar month. The Moon is a round ball of rock. The Moon does not make its own light. We can see the Moon it because it reflects light from the Sun. The Moon seems to be different shapes at different times of the month. These shapes are called phases of the Moon. The Moon has no water, so nothing can live on it. The first person to step on the moon was Neil Armstrong on July 20, 1969. Astronauts on the Moon have to bring their own oxygen and food to survive. The Moon’s gravity pulls on the Earth. The solid Earth cannot move, but the water in the seas and oceans is pulled towards the Moon which causes tides. We always see the same side of the Moon. A Full Moon causes the ocean to rise from its gravitational force.